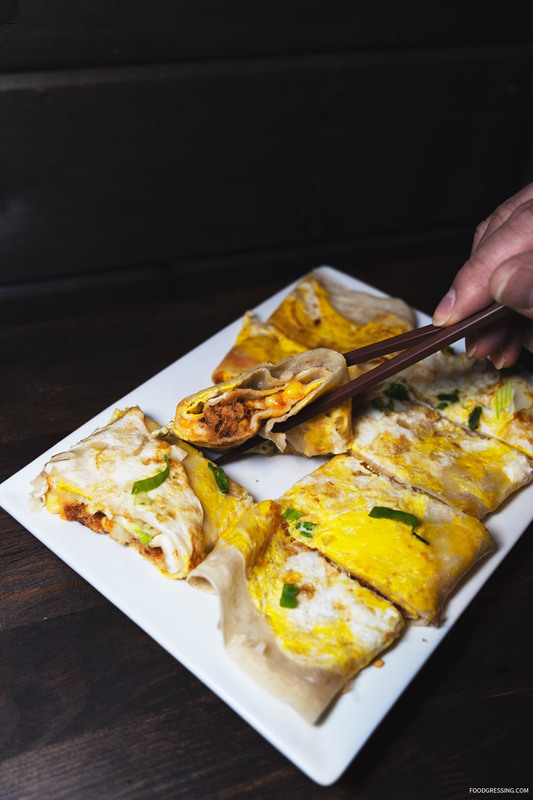 Newly open in the Burnaby is Old Street, a casual eatery specializing in Chinese Crepes and Taiwanese Beef Noodle Soups. 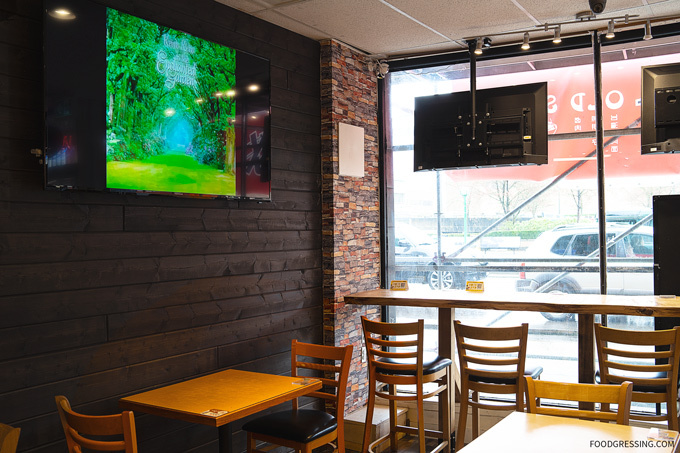 The restaurant opened just about two months ago at 4729 Kingsway across from Metrotown. I was invited for a media tasting. Here’s a look at what you can expect. The rustic-inspired interior features a mix of dining tables for 2 – 4 as well as counter seating by the window. 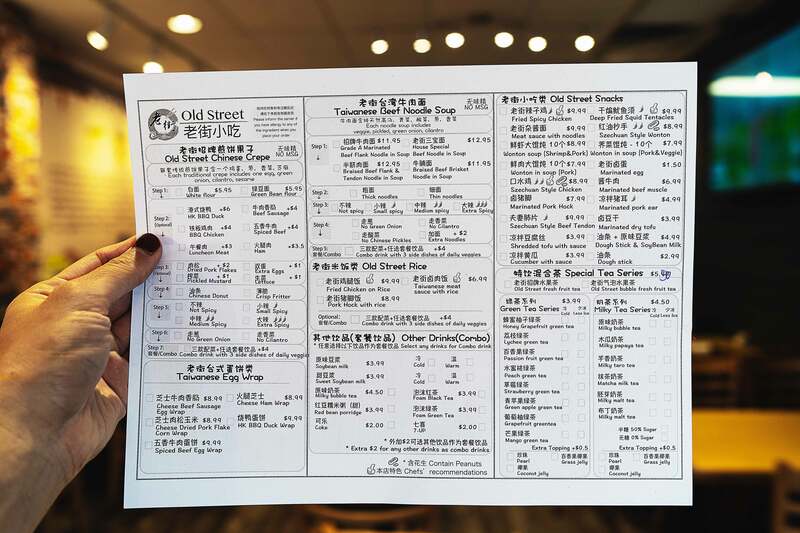 Old Street’s main offerings are customized Chinese Crepes which are made with white or green bean flour and have choice of protein (like HK BBQ duck, BBQ chicken, ham and so forth) and other fixings (like dried pork flakes, Chinese donuts, crisp fritter, green onion, cilantro and more). These crepes are MSG-free and you can select your level of spiciness. The crepes start at $6 and the protein/fixings are priced individually between $1 – $6. 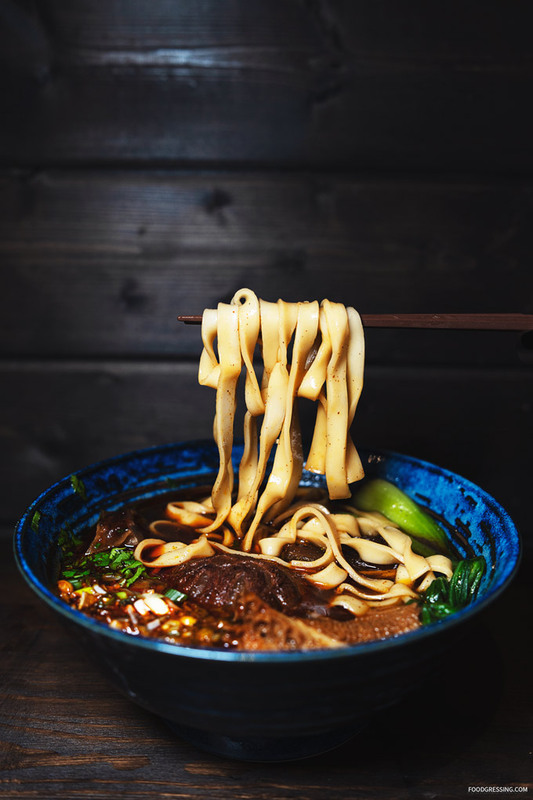 They also specialize in Taiwanese Beef Noodle Soups ($11.95 – $12.95) come with choice of protein (like Grade A marinated beef flank, braised beef flank and tendon and so forth) and choice of noodles (either thin or thick). 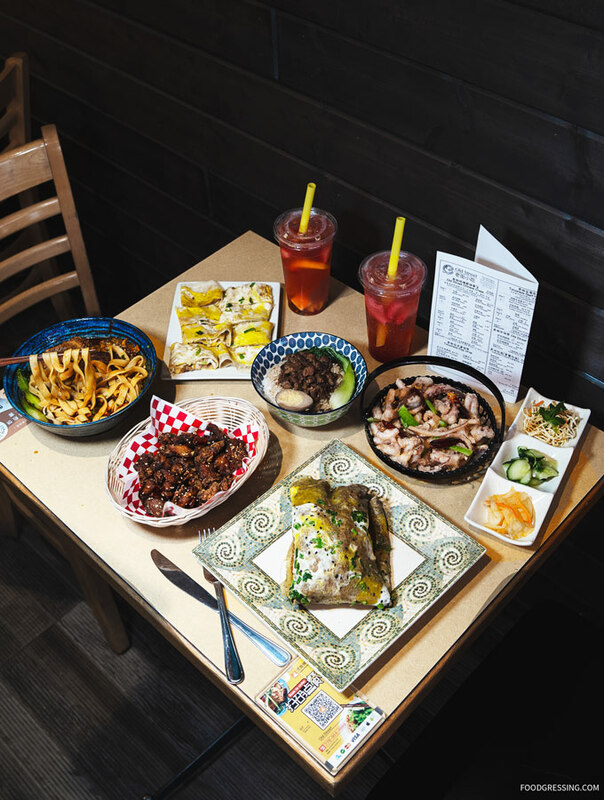 Other items rounding out the menu are Taiwanese Egg Wrap (like Cheese Ham, Spiced Beef and more), Rice Bowls (like Taiwanese meat rice sauce, pork hock, fried chicken), and Snacks (like cucumber with sauce, dough stick, marinated pork ear and so forth). 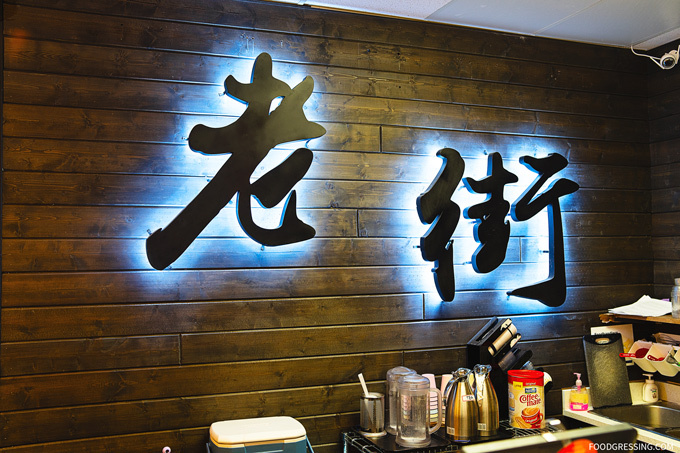 Old Street also offers a wide variety drinks from fresh fruit teas, bubble tea to soybean milk and soft drinks. You can click here for a full-sized photo of the menu. At our media tasting, we tried a range of their offerings. To start, we had a Chinese Crepe made with green bean flour and loaded with HK BBQ duck, dried pork flakes, and Chinese donut. It was customized to be a bit spicy. This crepe would have come out to be $14. Given the amount of ingredients, it’s definitely a meal in itself and fairly valued for the price. The crepe was not too thick which was nice. I would have liked the Chinese donut to be crispier but it was otherwise reasonably tasty. We enjoyed the House Special Beef Noodle in Soup with thick noodles and medium spicy ($12.95). 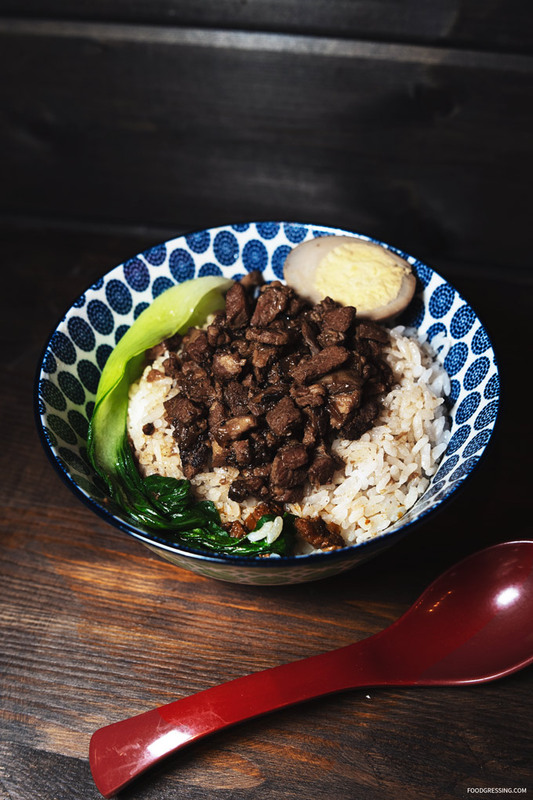 It was a hearty bowl with tender beef, veggies, green onion and cilantro. The Taiwanese Meat Sauce with Rice ($6.99) had a good amount of meat to rice ratio. It was reasonably comforting, flavourful and came with a soft boiled egg. 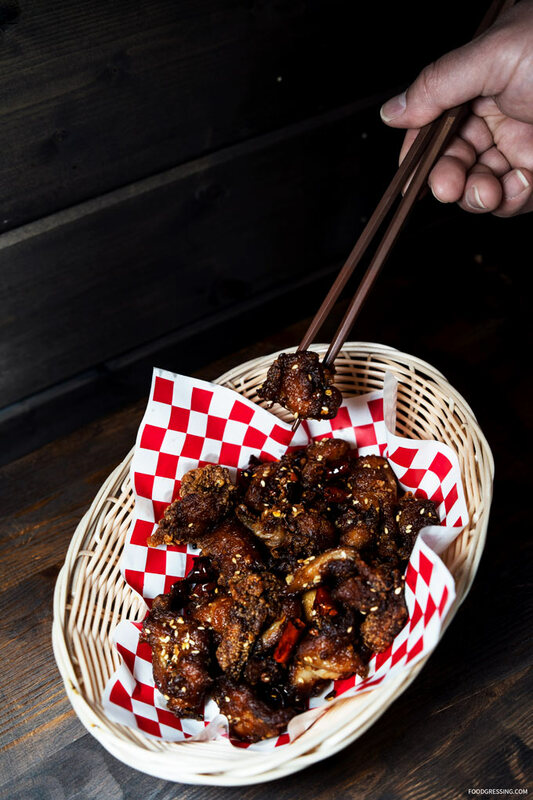 The Fried Spicy Chicken ($10) was a favourite of the tasting and I would recommend it. It was crispy on the outside, tender on the inside and had a good amount of heat to it. I liked that they actually used real Sichuan peppers. 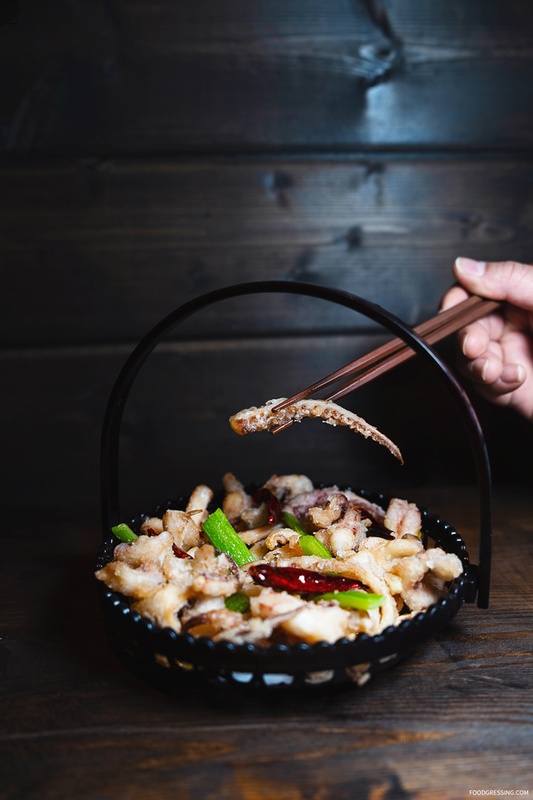 The Deep Fried Squid Tentacles ($10) came in a charming little basket. I enjoyed the Fried Spicy Chicken a lot more as the squid tentacles needed to be fried longer for more crispiness and more seasoning. 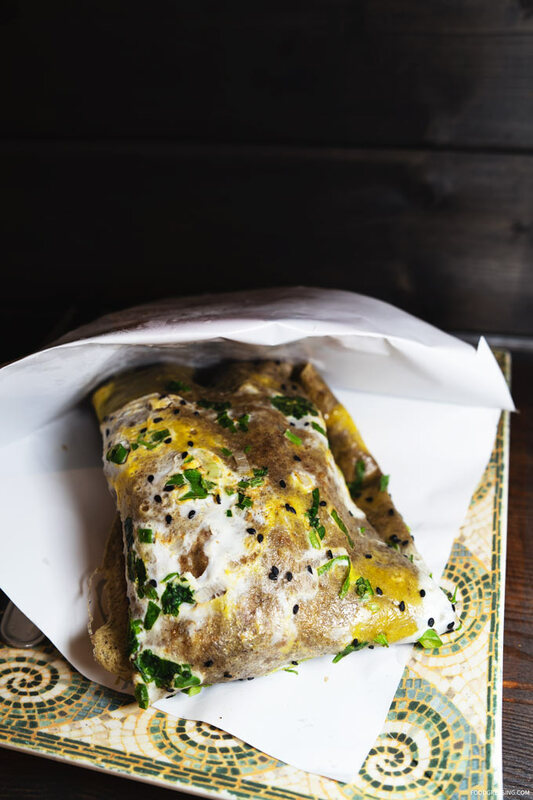 A newer addition to Old Street’s menu is the Taiwanese Egg Wrap ($9). We went with the Cheese Dried Pork Flake Corn Wrap. There was a good amount of pork flake incorporated and second to that would be the corn. I thought the cheese part was a bit understated. I’d personally go for the Chinese Crepe for a fuller experience. Overall, I thought there were some items that we tried which were reasonable in taste, quality and price. My top choices from the tasting are the Chinese Crepe, the Taiwanese Beef Noodle Soup, and the Fried Spicy Chicken.